Known for its hipster residents and eclectic mixture of shops, Hackney has become one of the most liveable areas in London in recent years. The East London borough han't only had a boom in independent coffee shops and artisan cafes but the restaurants have seen an evolution too. 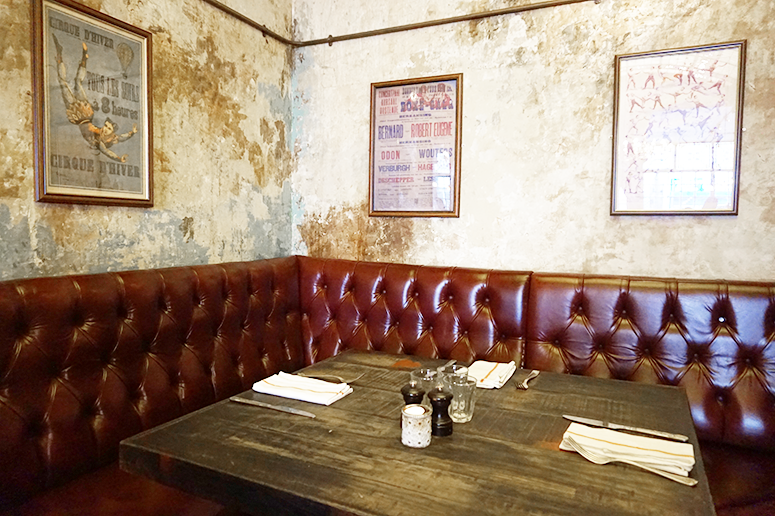 One such a foodie destination is the Elephant's Head – a traditional pub, restaurant and cocktail bar wrapped into on – which after a series of incarnations has recently returned to its Hackney hot spot under its original guise. With a rustic interior design, it has subtle touches of its circus namesake with vintage French posters adorning the walls. The dim lights added to the cosy atmosphere though it did make it tricky for me to take bright photos during our visit, so apologies for the washed out tone to them – the location and food looked much more vivid than my photos make them look! We visited on a Friday evening and the pub's location just off the main street didn't work in its favour as it was very quiet when we arrived. However, during the time we were having our meal, a few more people had joined us both in the restaurant and the adjoining bar at the front of the pub, which made more for a more cheerful Friday evening atmosphere. Being a restaurant with a full-working pub in the same establishment, The Elephant's Head has an extensive beer and cocktail menu. It being a Friday night, we of course had to order a cheeky cocktail with our dinner, it would've been rude not to. The Mitch Martini (Zubrowski vodka, apple juice, passion fruit syrup, Crème de Peche) was delish and I would've happily enjoyed multiple of them in a row, but I was trying to be good! 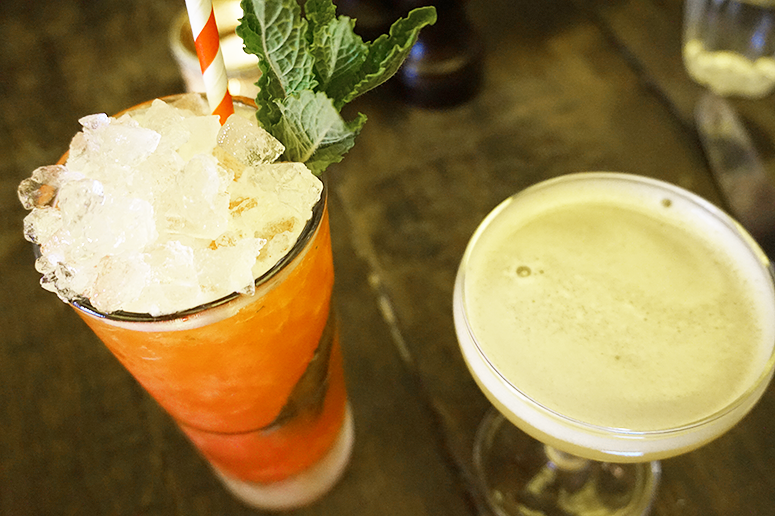 My friend chose the Grapefruit Julep (vodka, honey syrup, pink grapefruit juice, grenadine, mint leaves) which she enjoyed as well, saying the sharpness of the grapefruit was well balanced with the sweetness of the honey and the refreshing mint as a finishing touch. When perusing the menu we realised that the dishes we'd seen online and had looked forward to trying, such as a starter of Scallops, Fennel, Chili and Lemon and a main of Venison Braised in Red Wine, were actually a part of their March menu and no longer available. We should've noticed this ourselves, as the sample menu online does list the dates, but we were slightly disappointed that the current menu was a little more traditional pub fare than the fancier dishes listed online. Our starters, as a result, were quite disappointing and so I'll only stand still by them briefly. 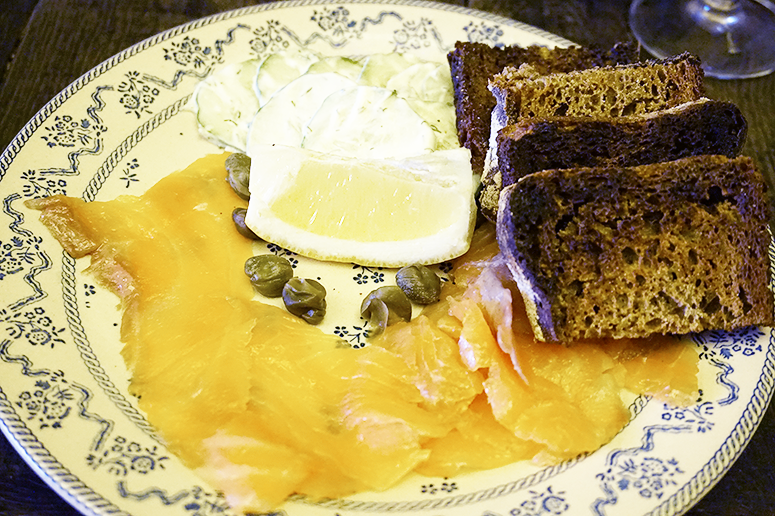 I opted for the Secret Smoke House Salmon, Cucumber & Dill With Dusty Knuckle 100% Rye Bread, which sounded great on paper but looked subpar on the plate. The bread was heavily burned and to tough to cut or bite into and while the salmon was nice enough the dish just wasn't that great as a result. 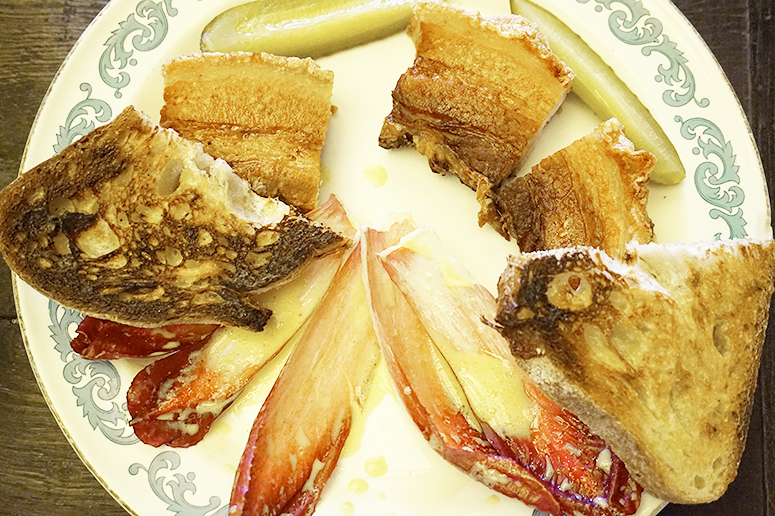 My guest chose the Pork Belly, Chicory & Mustard, which was a generous portion for a starter. She enjoyed the pork belly which was complemented well by the chicory but the addition of bread was unnecessary and was equally difficult to eat as mine had been. 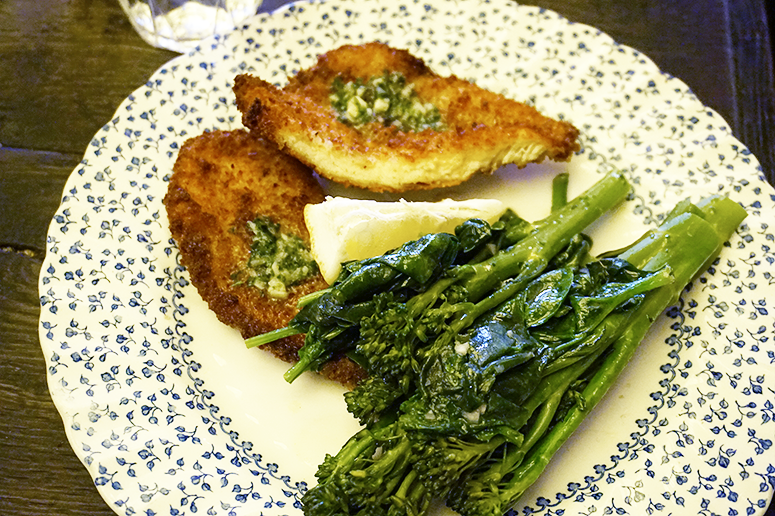 Finally, for our mains of the evening, my friend ordered the Chicken Escalope, Tenderstem Broccoli, Greens & Garlic Butter. As this did not come with any potatoes, she also had a bowl of Chunky Chips on the side. The escalope dish appeared small for a main course and definitely required the side dish to complete the meal as the greens were not sufficient with the escalope alone. The side dish of chunky chips was adequate but huge, far too large for one person to finish – so portion sizes definitely could use some adjustment in the future. My main was the Chickpea & Lentil Burger, Beetroot Hummus, Fennel & Parsley Slaw With Sweet Potato Fries, and this delicious vegetarian option really saved the meal for me. In contrast to the escalope dish, this burger and fries portion was perfectly proportioned and absolutely delicious to boost. 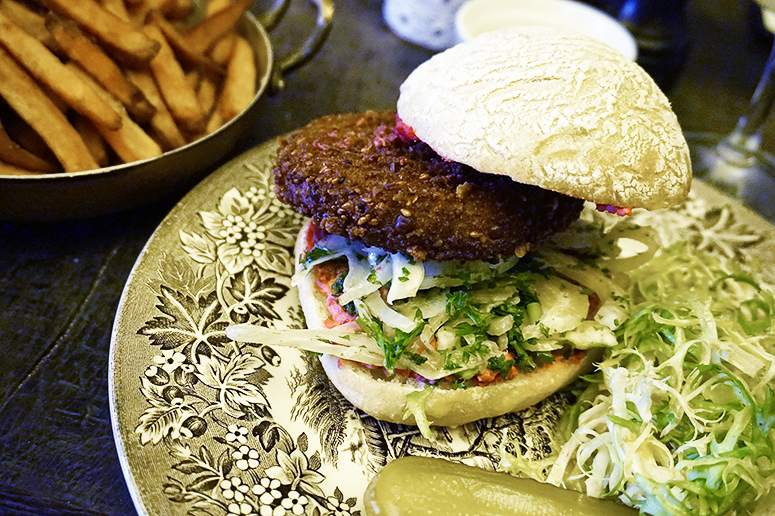 The chickpea & lentil burger was nice and crispy on the outside and packed a flavourful punch. The coleslaw added a nice crunch to the dish and the sweet potato fries were excellent too. It's only because I had a large lunch that I didn't finish ever single bite on my plate – but I'd happily order this one again! In all, the dishes are a little rough around the edges; burned bread being served, uninspired plating and portion sizes can use some work to make this a must-visit Hackney destination. However, with the scrumptious chickpea & lentil burger and a plentiful cocktail menu on offer, there are some definite winners on offer at The Elephant's Head and hopefully the next menu refresh will be able to match its beautiful and atmospheric setting. 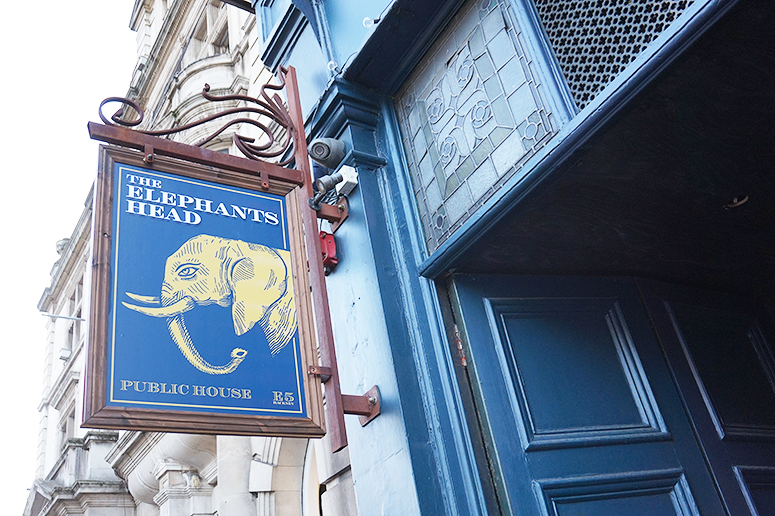 The Elephant's Head is located on 43 Lower Clapton Road, Hackney E5 0NS.